Classes and dates subject to change, please call us to join a class. Open project classes. Learn continental knitting and/or crochet. Hats, scarves, pattern reading and making your pattern work for you. Open project classes from basic scarves or hats to lace and cabled projects. Our experienced instructors will help keep you on task. Need help finishing a project? This is the class for you! Ever wanted to spin your own yarn? Now you can. 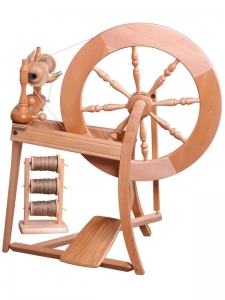 We will teach you the principles of spinning and how to use a spinning wheel or drop spindle. Bring your own wheel/spindle or rent one of ours. Optional $20 Materials / Equipment rental first hour. Class/rental fee refundable against same day new wheel purchase. Knit, crochet, quilt or spin. Our professional instructors are there for you. Private classes are $20 per hour for one on one time with a professional instructor. Please call if you are unable to attend class or will arrive more than ten minutes late. Students are expected to make every effort to attend revolving classes each week but will not be penalized provided they inform the teacher at least 24 hours in advance. Revolving class credits expire after twelve weeks unless prior arrangements have been made with the teacher. Specialist class credits will not be made up if a student fails to attend. In the event that a teacher is unavailable for class a substitute teacher will be arranged or the class will be rescheduled. Please make sure we have up-to-date contact information! Magic Loop for Hats and More! Learn in our open project classes. All experience levels welcome from beginners to experienced! Learn to make socks. Double points, circulars or magic loop. Learn ribbing, turning the heel and kitchener stitching. A great class to try your hand at fair isle! Beautiful fair isle design on the outside, and completely lined on the inside. Learn in our open project knitting classes. Class prerequisite:   Must know how to knit in the round using DPN, 2-circulars or magic loop. Fabulous cabled mitten class! Learn cables, knit in the round and enjoy this fabulous mittens! Come and learn the magical technique of Entrelac knitting! Make a scarf, sweater or just work on practice squares, your choice! We will show you a variety of ways to cast on and explain why you should be using a certain cast on method for different garments. Bring your project or start a new one. Bring your friends or make a new one! Come and have fun! Couch area is always available for sitting, knitting/crocheting and chatting!